Molybdoenzymes are ubiquitous and play important roles in all kingdoms of life. The cofactors of these enzymes comprise the metal, molybdenum (Mo), which is bound to a special organic ligand system called molybdopterin (MPT). Additional small ligands are present at the Mo atom, including water, hydroxide, oxo-, sulfido-, or selenido-functionalities, and in some enzymes, amino acid ligand, such as serine, aspartate, cysteine, or selenocysteine that coordinate the cofactor to the peptide chain of the enzyme. 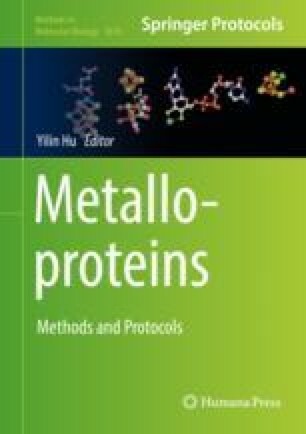 The so-called molybdenum cofactor (Moco) is deeply buried within the protein at the end of a narrow funnel, giving access only to the substrate. In 1974, an assay was developed by Nason and coworkers using the pleiotropic Neurospora crassa mutant, nit-1, for the reconstitution of molybdoenzyme activities from crude extracts. These studies have led to the understanding that Moco is the common element in all molybdoenzymes from different organisms. The assay has been further developed since then by using specific molybdenum enzymes as the source of Moco for the reconstitution of diverse purified apo-molybdoenzymes. Alternatively, the molybdenum cofactor can be synthesized in vitro from stable intermediates and subsequently inserted into apo-molybdoenzymes with the assistance of specific Moco-binding chaperones. A general working protocol is described here for the insertion of the bis-molybdopterin guanine dinucleotide cofactor (bis-MGD) into its target molybdoenzyme using the example of Escherichia coli trimethylamine N-oxide (TMAO) reductase.